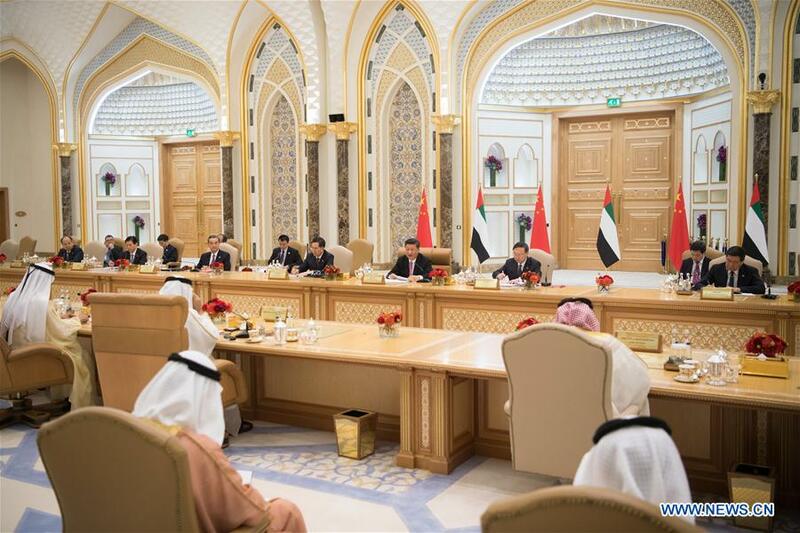 ABU DHABI, July 20 (Xinhua) -- China and the United Arab Emirates (UAE) on Friday decided to upgrade their bilateral relations to a comprehensive strategic partnership. The decision was made as visiting Chinese President Xi Jinping held talks here with UAE Vice President and Prime Minister Sheikh Mohammed bin Rashid Al Maktoum and Crown Prince of Abu Dhabi Sheikh Mohammed bin Zayed Al Nahyan. By lifting their ties, China and the UAE will strengthen their bilateral in-depth cooperation in various fields, and promote continuous development of bilateral ties on higher levels, in broader areas and at greater depths. Xi arrived here for a state visit to the UAE on Thursday, the first by a Chinese head of state in 29 years to the Arab state. Xi expressed his gratefulness to the UAE for its grand welcome of his visit, which shows the friendliness of the UAE toward the Chinese people, as well as the great importance it attaches to its ties with China. Xi recalled his meeting with the Crown Prince in Beijing in 2015 when the two sides reached many important consensuses on promoting bilateral friendly cooperation, saying that bilateral relations have since entered a new stage of development that is comprehensive, fast and in-depth. China-UAE cooperation has a bright prospect and great potentials, stressed the Chinese leader. The establishment of a comprehensive strategic partnership will be conducive to deepening strategic mutual trust and lifting the level of mutually beneficial cooperation, Xi said. He said he is confident that China and the UAE can become good friends and good partners who learn from and help each other, and achieve common development and prosperity. The Chinese president conveyed his warm regards to UAE President Sheikh Khalifa bin Zayed Al Nahyan, and wished him an early recovery. Xi called on the two countries to translate the China-UAE comprehensive strategic partnership into concrete achievements, cement political mutual trust, continue to take care of each other's core interests and major concerns, and support each other's pursuit of development path that suits themselves. China and the UAE, Xi said, are natural partners for jointly building the Belt and Road. China regards the UAE as a key pivot in implementing the Belt and Road Initiative and appreciates the Crown Prince's vision of revitalizing the ancient Silk Road. The two sides need to create stronger links between their development strategies, strengthen communications on industrial policies and plan and manage well the flagship projects within the framework of the Belt and Road Initiative, so as to boost the economic development of the Middle East region and the Gulf region. China is willing to work with the UAE to build an all-round and all dimensional energy cooperation pattern, deepen investment and financial cooperation, and promote cooperation in the area of innovation, Xi said. He also urged the two countries to strengthen security cooperation and fight against all forms of terrorism. People-to-people exchanges should be enhanced while inclusiveness and mutual learning between different regions and cultures should be further encouraged, noted the Chinese president. China is willing to share its experience with the UAE to make the World Expo 2020 in Dubai an impressive event, Xi said. At present, the majority of people in West Asia and North Africa are longing for social stability, said the Chinese leader, adding that peace, reform and development are today's irresistible trend. China stands ready to work with the UAE to deepen strategic cooperation, explore ways of achieving peace through development in the Middle East, address hotspot issues via political channels, so as to jointly promote the security and stability of the region, Xi said. During his talks with Xi, UAE Vice President and Prime Minister Sheikh Mohammed bin Rashid Al Maktoum said he hopes President Xi will feel at home during the visit. The UAE admires China's development model and its achievements, appreciates its pursuit of an opening-up development strategy, said the UAE vice president and prime minister, adding that his country is willing to carry out closer cooperation with China in a wide range of areas and stay as a reliable friend of China. He said he is confident that Xi's visit will bring UAE-China partnership to a new height, and pledged that his country will continue its active participation in the Belt and Road Initiative. Crown Prince of Abu Dhabi Sheikh Mohammed bin Zayed Al Nahyan, for his part, said that his visit to China in 2015 remains fresh in his memory, and that his country is delighted to host President Xi for this historic visit. The UAE fully agrees with Xi's foresight and concept in governance, he said, adding that he believes that China will have a bright future and make greater contributions to world peace and human progress. The Crown Prince pointed to the great potentials in bilateral cooperation in such areas as politics, economy, finance, science and technology, energy and people-to-people exchanges, saying that it is always the priority in the UAE's diplomacy to deepen its traditional, strategic and friendly ties with China, which the UAE sees as a brother. The UAE firmly sticks to the one China policy, appreciates China's important role in international affairs, and will strengthen communication and coordination with China on major issues like development and counter-terrorism, said the Crown Prince. After the talks, the two sides issued a joint declaration on establishing a comprehensive strategic partnership. Leaders from both sides witnessed the signing of the cooperative document on the Belt and Road Initiative. President Xi was conferred with the Order of Zayed, the UAE's highest civil decoration, by the Crown Prince, who also gave Xi an Arabian horse as present. Arabian horses are given as diplomatic gifts to distinguished guests by the UAE's royal family.